Who will win 2019 Monte Carlo? Haven't ever watched Marko play doubles. They should communicate well being brothers. I doubt it will translate into a deep run though. Djokovic and Fognini were a good team. Basically it's very clear he's no top 300 player, but he's adequate enough to make a doubles match competitive if they win the important points and if Novak wins the few extra sick points by doing Novak things..
What’s happened to Carreño Busta? Got intimidated by TTW mocking? is it really that cold on monaco? Likes: gogo and vive le beau jeu ! Did Novak forget to change out of his pajamas. Kei looks like he's wearing his younger brother's clothes. PCB is currently undergoing anger management therapy. The fashion trends they are trying to sell. Sadly, this is already the trends - they are just copying. I wonder if they choose to dress like that, or if they are paid. Probably depends on the player? How many have dress clothes sponsors? His trousers are too short for him and what's with that haircut?? 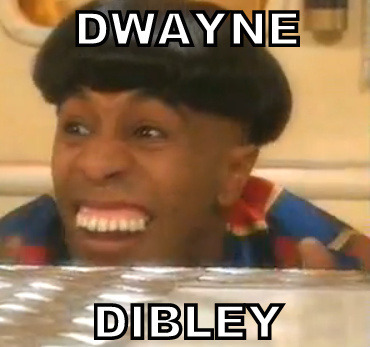 He looks like Dwayne Dibley from "Red Dwarf"! Felix looking classy. He'll hold his own style-wise. Yes, he is maybe the best dressed after the Prince. Gee how big of a fluke is Pouille? Gets to the AO SF just to be a pigeon and then doesn’t win a single match outside of the AO. Going for Thiem more in hope but hard to look past Nadal. Felix and Denis teaming up in the doubles as are Novak and younger bro Marko (always felt a little sorry for the sibling). Turning out to be yet another French player who failed to live up to his early promise. Medvedev lookin' good, will win the Kremlin Cup. Still very much like himself, asking Bernardes to check the height of the net while he was up 3–0 in the first. The net was of course the right height. Please GIFify Felix's response in the stands to Shapo's backhand pass. This is a matter of utmost importance. The biggest hilarity is when Marko is the one playing a great point and Novak is the one ****ing up routine volleys. It's unbelievable how Shapo's game gets exposed on clay. Pouille, Monaco, PCB remain on my top 3 overrated players list. Raonic gets an honorary position. Wonder if Fognini considers MC his home tournament. He hails from Sanremo which is like 15km away just over the border and resides in a neighbouring town. Turning out yet anothe French player who failed to promise things he could deliver. As a huge cycling buff, we all know Sanremo as the finish of Milano-Sanremo, the longest one day race in the sport. Then I found out that the Giro d'Italia of 1987 started in Sanremo like 3 days before Fabio was born there. Is it me or does Fabio look a bit chubby. Could be, but maybe not because different nation and all that. When I was in Monte Carlo, Italy was like literally the next stop on the bus route tho, so the distances are indeed small. Rublev somehow forgot his brick hands at home this morning, and has thus made a few competent volleys. Up 4–1 in the second, seemingly headed for the victory. Not so fast, @Sysyphus! The mercurial one has pushed on to take the lead...will he stay the course? I think it’s just his sort of sway back strutting that pushes that bit of stomach out! This is the one thing I hate about clay: no hawkeye, which leads to bad calls. Just like last year, Rublev chokes a match he should have won in MC. I took a look at their H2H and although Djoko leads the series comfortably 8-2, the scorelines suggest that he never really had an easy match againt the German. This is gonna be a very tough 1st round for Djoko. Interesting that the city has an Italian name even though the principality is French-speaking. The tournament is played on French soil not in Monaco contrary to what many believe. And BTW, Monte Carlo is the name of a neighbourhood in Monaco. Dearie me, they all look like twats.